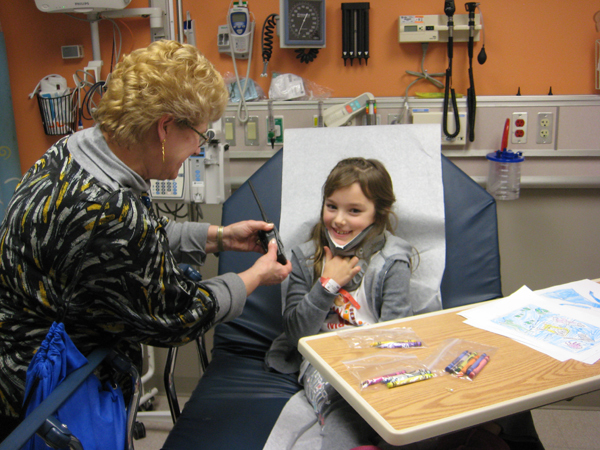 Patients in the ER at Akron Children’s Beeghly campus had the opportunity to give Santa their wish list over the radio, thanks to the Mahoning Valley Amateur Radio Association. The sound of Santa’s voice crackles through a hand-held radio device. The little girl, wearing a tiger gown, perks up and smiles, her eyes alight as she hears Santa calling her name. Thanks to the Mahoning Valley Amateur Radio Association, our patients at Akron Children’s Beeghly campus had the opportunity to talk to Santa, who was calling from the North Pole, over the radio. The radio association has volunteered for this event, SantaNet, for the past 6 years at Beeghly and for several more years before that at other locations. This is my third Christmas working at Akron Children’s, and I always enjoy hosting this group, watching them interact with our sick kiddos, and seeing the change in the room when the kids hear Santa over the radio. Some of them get really excited and start listing off everything on their lists, while others shyly smile and quietly ask for the one item they most want. It is so sweet to hear their voices as they wish Santa a merry Christmas. Meanwhile, the parents’ faces, etched with worry lines, gradually relax and ease. As the certified child life specialist in the Emergency department, I know how important it is to help make the hospital environment less intimidating. Bringing “normal” into the hospital – especially during the holidays – can make it so much more bearable for our patients and families when they would rather be at home. Some of these kids may not be able to go see Santa because of their illness, so talking to Santa via the radio helps add that “normal” element to the Christmas season despite the hardships the families are facing. I am thankful for outside groups who make a special effort to reach out to our kids. More importantly, the families appreciate the extra special touches which show that others really do care about them. During this season when everything gets so busy and patience wears thin, it’s natural to feel worn down, but I think this is the time when it’s particularly important to do the little and big things that show we care. Seeing the wonder radiate from these kids during SantaNet helped remind me of the reason I love my job and encourages me to continue on with kindness, respect and joy. For me, this means that it won’t be Santa or presents that will fill me with wonder, but rather the assurance that the story of Christ’s birth doesn’t end when the baby is placed in the manger. It is this truth that gives greater meaning to my Christmas celebration, and I hope it will for others, as well. Rebecca Kuzman is a certified child life specialist in the ER at Akron Children's Beeghly campus in Boardman, Ohio.